I would like to take a moment to note that, despite the fact that I have been plugging away at this book since January, I am actually a very fast reader. The problem is that Volume 1 is a hefty 700 plus pages, including a very thorough index and lengthy explanatory notes. It just does not fit in the purse so easily. And so it has remained next to my bed for the past seven months, waiting patiently for a few spare moments before sleep. That being said, I did enjoy my time with Samuel. Mark Twain is one of my favorite writers. You have to love that he foresaw that people would be excited to read his biography 100 years after his death. He does not write in the typical fashion - here I was born, here was my childhood, etc. Instead, he dictates things as remembers them and includes letters, newspaper articles and journal entries within the pages. This format would not work for a lot of writers, but in this case we readers are thankful that he doesn’t “mind excursioning around in an autobiography – there is plenty of room. I don’t mind it so long as I get the things right at last, when they are important.” As in his fictional writing, Twin is delightful in his memoirs. 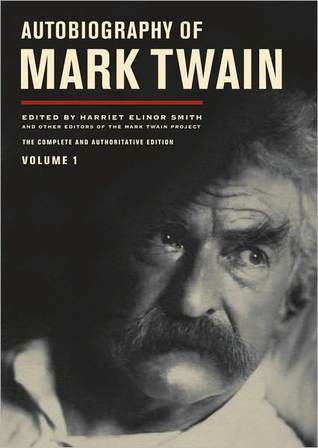 This book gives a wonderful dose of the wry, sarcastic Twain that we love from his other writing. It is so much fun to read his take on the people and events of his day. He holds nothing back because he knows that everyone will be gone by the time this is published. It’s also lovely to see his day to day relations with his family. A portion of the book revolves around the biography his daughter Susy wrote before her early death. His love for her is apparent in every one of these pages, even as he indicates that her regard for him may be much higher than his actions deserve. I look forward to reading Volume II (does anyone know when that is expected? ), but my back will probably not appreciate lugging it around any more than its predecessor. Do you have a favorite Twain book/story? Tell me about it in the comments!